I've recently had the honor of serving on the StampTV August Center Stage Spotlight Design Team and have enjoyed working and chatting with some of the other CSS DTs. 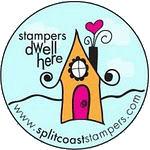 This past week, Vicki hosted the color challenge on StampTV to use pink, gray, black, and white. I just couldn't resist these pretty colors and had to play! 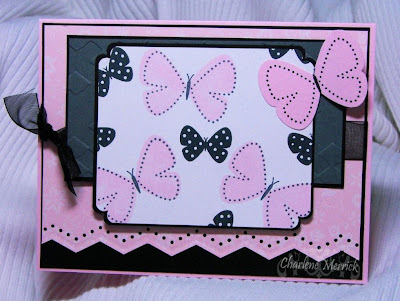 The pink butterflies were stamped with Pink Pirouette with a Basic Gray outline. The small polkadotted butterflies were stamped in black. I then stamped one butterfly onto Pink Pirouette cardstock and punched it out with the corresponding SU butterfly punch to add it to the upper right corner and lift one of the wings for dimension. 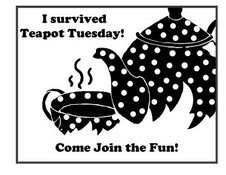 I used Pink Pirouette designer paper for the background and punched that with one of my favorite border punches: the zig zag punch. I hope you're having a great day today and get to spend time doing the things you love to do....whatever that may be. And always remember to tell the ones you love how much you appreciate and love them! 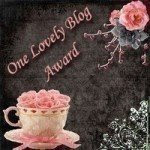 I sure appreciate all of you who stop by my blog and leave such wonderful, uplifting comments! gorgeous! my fav color combo. i luv you, too! This is sooo pretty Charlene! What a great combo--congrats on the Stamp TV gig! Congrats Charlene, they are lucky to have you, love your c ard!! They sure are blessed to have you, Charlene!! And I'm blessed to know you as my friend! 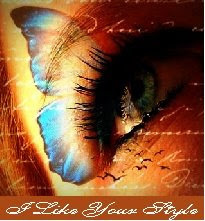 Love this color comination, and what you've done with it here!! Hey, you! Congratulations on your Guest DT spot with Sharon Johnson! AWESOME!! Loving this beautiful color combo...great job. So soft and feminine....you really have made some wonderful card. i remember seeing this one at SCS but don't know if I commented...its beautiful!